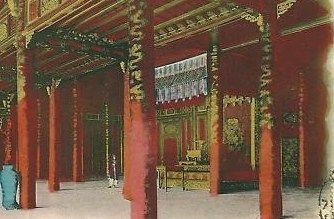 Notes: A stemcup of similar form and decoration to that of the present example is in the collection of the Beijing Palace Museum, illustrated in Blue and White Porcelain with Underglaze Red (I), The Complete Treasures of the Palace Museum, Hong Kong, 2000, p. 14, no. 12. The Palace Museum example, dated to the Yuan dynasty, is also moulded with similar striding dragons on the interior but has an additional plantain leaf band in underglaze-blue around the stem foot. 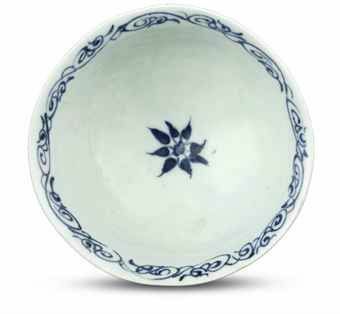 It has been mentioned that glazes of blue and white wares of the mid-Yuan period have a greyish tinge, which by the late Yuan had become more lustrous, ibid, p. 14. Judging from the brilliance of the glaze and richness of the cobalt-blue, it is possible that the stemcup dates to the late Yuan, or perhaps early Hongwu period. 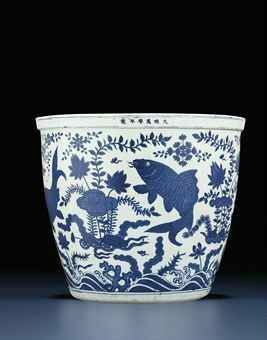 The vibrant underglaze-blue colour and painting style of the dragon, together with the 'bamboo'-form stem foot are also characteristics found on a larger stemcup (14 cm. high) excavated in Nanjing in 1970 from the tomb of Wang Xingzu dated to the 4th year of the Hongwu period (AD 1371), now in the Nanjing Museum. The excavated example was originally reported in Kaogu 1972:4, p. 32 and pl. 6, figs. 1 and 2; and published again by Wang Qingzheng in Underglaze Blue and Red, Hong Kong, 1987, no. 31, dated to the late Yuan/early Ming dynasty. As with the present example, the exterior has a three-clawed underglaze-blue dragon and two moulded four-clawed dragons to the interior. 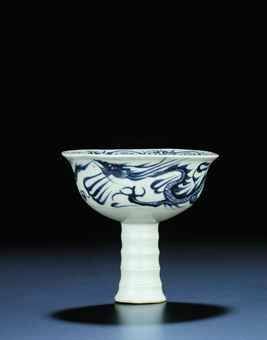 Compare a similar stem cup from the Palmer Collection illustrated by Sir Harry Garner, Oriental Blue and White, London 1954, pl. 2A and by E. Bluett, 'Chinese Works of Art in English Collections: The Collection of Mr. and Mrs. R.H.R. Palmer - I', Apollo, April 1958, pl. 160, fig. VIII(c), later sold at Christie's Hong Kong, 17 January 1989, lot 561, and later in the collection of the Tsui Museum of Art, Hong Kong, illustrated by J. Ayers in the Catalogue, 1990, no. 57. Another very similar example in the A. Brankston collection was illustrated by S. Jenyns, Ming Pottery and Porcelain, London, 1953, pl. 3c (iii) and two similar examples from the collection of Mrs. Otto Harriman and the other in the collection of Lord Cunliffe were included by the Oriental Ceramic Society exhibition, Chinese Blue and White Porcelain, 14th to 19th Centuries, London, December 1953 - January 1954, nos. 11 and 12.